The freshmen accounted for nearly 53 percent of the Panthers’ goals this season. Coming into the season, 23-year head coach Dave Floeck wasn’t sure what to expect out his Whitman-Hanson Regional High girls’ soccer team. 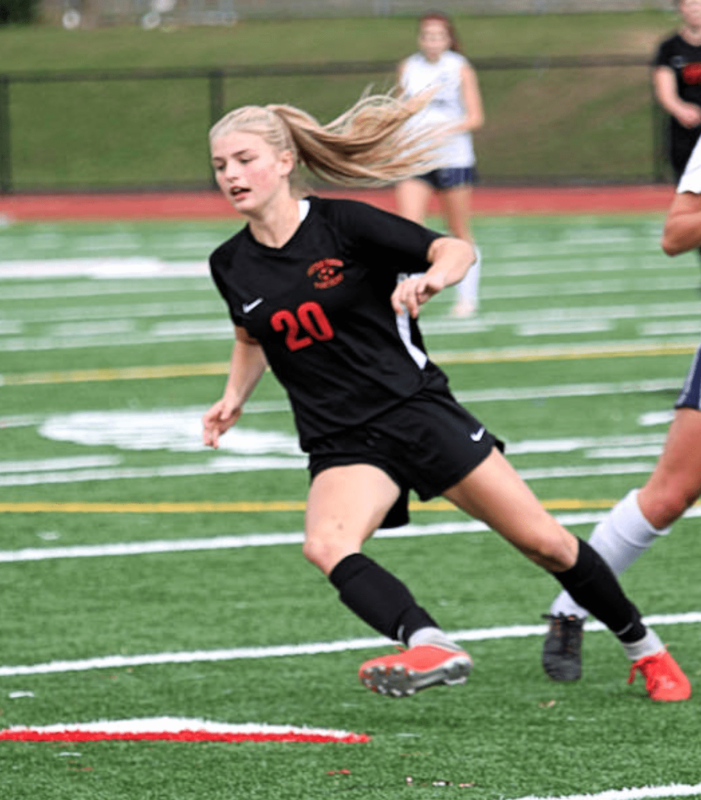 The Panthers were looking to make up for the graduation of nine seniors, most critically Lauren Bonavita, who cemented herself in program history with a 43-goal senior season to become its all-time leading goal scorer with 113. He knew his team was going to be young, and that one girl wouldn’t replace the foot of Bonavita, it was going to be a joint effort. But if you told him over half (27 of 51) of his team’s goals would come from freshmen, he would have never imagined. “Certainly, I think the impact our freshmen had was a nice surprise,” Floeck said. Freshman striker Kelsee Wozniak led the way with 11 tallies to go with seven assists for the Panthers, who finished the season with a 14-2-4 record after a Div. 1 quarterfinals loss to Hingham, 2-1. Along with being named a league all-star, she was selected as First-Team All-Eastern Mass. “For her to come in as a freshman and lead our team in scoring was certainty a tremendous accomplishment,” Floeck said. Wozniak pumped in multiple goals on numerous occasions, including a hat trick in a 5-1 season-opening win against Notre Dame Academy of Hingham. Fellow freshmen Olivia Borgen and Nora Manning added eight goals apiece, which was good for second on the team. “Olivia Borgen, who is a very talented player, some of her development is going to be around just getting stronger,” Floeck said. However, scoring wasn’t the Panthers’ strength, as they tallied just 51 goals on the season, a nine-year low for the program, according to Floeck. In net, four-year starter, senior captain Skylar Kuzmich, helped the team to eight shutouts. The Hofstra-bound goalkeeper was named a Patriot League All-Star and was selected as First-Team All-Eastern Mass. In the back, Patriot League All-Star and junior Samantha Perkins, classmate Erin Wood, senior captain Olivia Johnson and freshman Ava Melia were standouts. In addition to netting seven goals, Boston College-bound senior captain Sammy Smith often defended and most of the time locked down the opposing team’s best offensive talent. She was named an All-American, selected as First-Team All-Eastern Mass. and tabbed a Patriot League All-Star. Floeck said the high point of the season was Oct. 1 when the Panthers battled Hingham to a 0-0 tie on the road. “We felt like our team, for that point of the season, really showed they could compete against one of the best teams around,” Floeck said. Three weeks later, the Harborwomen knotted W-H up, 1-1, at Dennis M. O’Brien Field. The Panthers fell into an early 1-0 hole, which was a problem all season, before junior Riley Bina (six goals) scored the equalizer late. W-H hung with Hingham all season in the Patriot League Keenan Division standings, but a 2-2 tie against Plymouth South in late September proved costly for the Panthers as the Harborwomen won the division by one point. “I do think we were good enough to win the Patriot League, and I don’t know if I would have said that coming into the season,” Floeck said. Floeck said he’s looking to see improvement in the goal scoring department next season, but noted it’s not going to happen overnight with such a young nucleus.